“We have chosen a way that works in most courts on most days” GGU litigation center director Wes Porter said, referring to the trial strategy taught to future courtroom attorneys. It’s a bit like poker, the business of trial law. For better or worse, players are rarely dealt the same cards. Nor do courtroom attorneys, whether in civil or criminal practice, encounter the same exact variables in their cases: witnesses, evidence, opposing counsel, judges and juries. Since none of the participants can count on having the best hand, what separates the winners from the losers are the skills they bring to the contest. And those skills can be taught. That’s where Wes Porter comes in. Teaching future lawyers a strategy that they can adapt to a variety of cases is his mission as director of the Golden Gate University School of Law’s litigation center. Although the San Francisco law school has emphasized litigation for decades, the center that began when Porter started six years ago brings under one umbrella a coordinated panorama of programs. 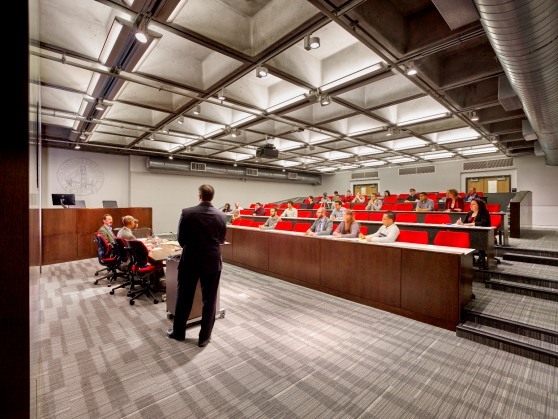 They range from doctrinal courses to extracurricular opportunities such as mock trial competitions and real-world training to prepare future trial lawyers for the courtroom as soon as they start work. 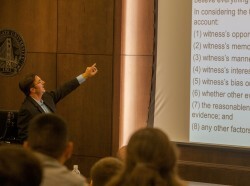 Through rigorous and repeated simulations, the students master skills including case analysis, how to tell stories through litigation rather than simply presenting facts, how to impeach a witness and how to make an effective opening statement, Porter said. That kind of training is vital both to law graduates competing for work and law schools competing for students. The number of new students admitted each fall at the 200-plus U.S. law schools has declined 28 percent from its 2010 high, to 37,924, as an oversaturated job market has left many recent graduates unemployed and grappling with more than $100,000 in student-loan debt. Indeed, just last summer, the American Bar Association’s Section of Legal Education and Admissions to the Bar, the U.S. Education Department’s designated accrediting agency for law schools, began requiring six credit-hours of practical education for students earning a juris doctorate. A former federal prosecutor who moved into academia in 2010, Porter crafted the center’s focus, to some degree, from his own experience as a trial lawyer, particularly with the U.S. Department of Justice. For Aseil Mohmoud, a 2014 graduate of Golden Gate who was offered a job at Duckworth Peters Lebowitz Olivier, the San Francisco firm where she interned as a student, the litigation center’s programming and its emphasis on practice had a direct effect. Through rigorous and repeated simulations, GGU litigation students master skills including case analysis and how to make an effective opening statement. “The people who hired me had seen me in one of my mock trial competitions as well, so they not only saw me as an intern in their office, they were able to see me as an advocate in the courtroom,” said Mohmoud, who also interned at both the White House and the Department of Labor. She is now a plaintiff’s attorney specializing in employment law. Golden Gate Law, through the litigation center, hosts the In Vino Veritas national mock trial competition each fall, with 16 teams from around the U.S., according to its website, and the school’s own team competes in a variety of regional and national competitions. Hosting such events, in which Golden Gate alums are invited to serve as judges, gives those lawyers a chance to meet and mentor current students. Mohmoud’s experience at the litigation center began with its Summer Trial & Evidence Program, also known by the acronym 1st STEP, in which she participated after completing her 1L year. The program started with a one-week boot camp, in which students spent one day each on topics such as direct examination, cross examination and objections. Always intrigued by criminal law, Mohmoud knew before enrolling in Golden Gate that she wanted to be a litigator. Being contacted by former students who tell him how they built on that practical training to land jobs, earn promotions and win trials is among the most rewarding aspects of his own position, Porter said.